The MFN201-E manual flooring nailer features a ratchet drive mode that allows the user to strike the driver multiple times in case the cleat is not set flush with the first blow. 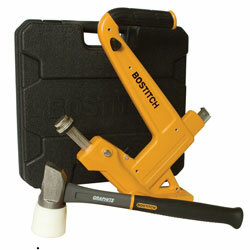 The ratchet mode can also be disengaged for single blow operation. The tool features rubber bumpers on the side and front to minimise any damage to expensive flooring and comes complete with a graphite anti-vibration mallet.